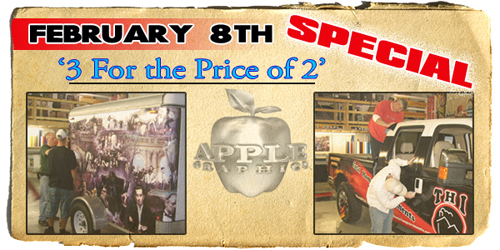 Apple Graphics is having a SPECIAL for Vehicle Wrap Training on February 8th. We currently have 1 spot booked for the 8th, and are looking for 3 more to fill the Training for that date. Our special for February 8th is '3 for the price of 2'. Any business interested in having their employees trained to wrap can send 3 people and only be charged for 2 that day! The only stipulation is that all 3 must sign up together in order to get this great deal. Included in this one-time deal, you will receive 2 Starter Supply Kits with an option to purchase a third Kit. This is a great opportunity for any graphics or sign business looking to have their employees trained in vehicle wraps. Apple Graphics will train them in every aspect of vehicle wraps, from equipment to post heat. Call NOW to get signed up for February 8th!